Each project requires a unique mix of models and tools. Below, we provide a few basic requirements gathering templates to get you started in the requirements elicitation and documentation process. These are not all the tools you’ll need for your requirements project (a good place for a more comprehensive list of model templates is Visual Models for Software Requirements), but they will help your through some of the initial stages. Seilevel’s Senior Product Managers have created this guide to help you develop more effective Use Cases. 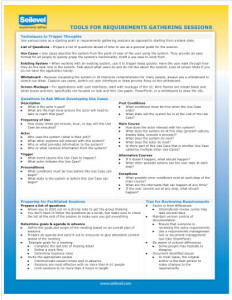 It also covers techniques to trigger thoughts and questions to ask in requirements gathering sessions.